Did you know that only 8 percent of the people that set a New Year’s resolution actually achieve their goal*. Why is that? Research from Psychology Today has found that making your resolutions work will involve changing behaviors—and in order to change a behavior, you have to change your thinking (or “rewire” your brain). This takes work. We have to set specific, measurable, time-bound goals and keep them front and center. If you are one of the millions of people in the United States compelled to make a New Year’s resolution, here are some helpful tips from Ray Williams of Wired for Success, to help you make them work**. Focus on one resolution, rather than several and set realistic, specific goals. Losing weight is not a specific goal. Losing 10 pounds in 90 days would be a better goal. Don’t wait until New Year’s Eve to make resolutions. Make it a year long process, every day. Take small steps. Many people quit because the goal is too big, requiring too much effort and action all at once. Celebrate your success between milestones. Don’t wait for the goal to be finally completed. Focus on the present. What’s the one thing you can do today, right now, toward your goal? Achieving your New Year’s resolution goal should be a process and you should enjoy the ride throughout the new year. 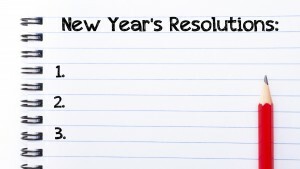 Do you set New Year’s resolutions? If so, what’s your goal? If not, why not? Join the conversation over on our Facebook page.